WHAT DOES IT TAKE TO MAKE IT IN THIS INDUSTRY? 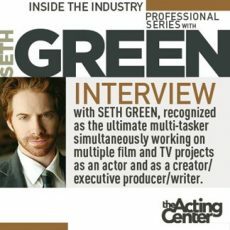 The Acting Center would like to welcome you to our Inside the Industry Professional Series where we speak with top professionals in their fields about their career successes, how they broke out or were discovered, secrets of their career longevity and much more. Hosted by America’s Got Talent star, Jim Meskimen. of sustaining a successful career in hollywood. ,,, An interview with legendary, Golden Globe & Emmy-Nominated actress Marion Ross, whose career started at Paramount Studios when ingénues would be “on contract” and has continued all the way up to today’s world of television and independent films. Ms. Ross knows the profession of acting like few others. Share this time with Marion as she is interviewed on the stage of The Acting Center by her son, actor Jim Meskimen, and relates her experiences with Sir Noel Coward, Cary Grant, Clark Gable and the casts of Happy Days, Gilmore Girls, That ’70’s Show, Sponge Bob Square Pants, The Drew Carey Show and many, many others. Not many actresses have enjoyed such a long, vibrant and busy career in film, TV and theater like Marion Ross. Discover the inspiring choices she has made to create a life of excitement and fulfillment in the arts.